﻿ 2 Peter 1:7 and in your godliness, brotherly kindness, and in your brotherly kindness, love. your godliness with brotherly kindness, and your brotherly kindness with love. and in piety, brotherly affection, and in brotherly affection, love. And in [exercising] godliness [develop] brotherly affection, and in [exercising] brotherly affection [develop] Christian love. 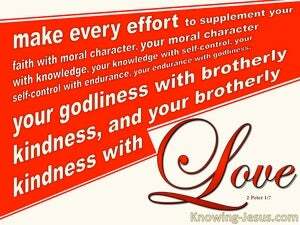 and brotherly kindness along with your godliness, and with your brotherly kindness, develop love. And love of the brothers to fear of God, and to love of the brothers, love itself. and to godliness, brotherly kindness, and to brotherly kindness, love. to piety, fraternal affection: and to fraternal affection, universal benevolence. and to godliness brotherly kindness; and to brotherly kindness divine love. piety with a spirit of brotherhood, and the spirit of brotherhood with love. and to patience godliness, And to godliness brotherly kindness, and to brotherly kindness love. and in fear of God, brotherly love; and in brotherly love, charity. And in devotion brotherly love; and in brotherly love, love. and with godliness, brotherly love, and with brotherly love, love. 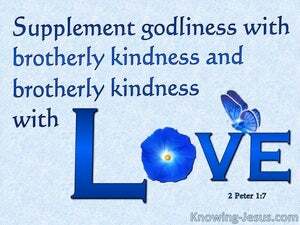 and with godliness, brotherly kindness, and with brotherly kindness, love. in godliness, brotherly kindness; in brotherly kindness, love. piety with brotherliness, brotherliness with Christian love. and to piety brotherly love, and to brotherly love, love itself. to godliness, brotherly affection; to brotherly affection, unselfish love. and to godliness brotherly kindness, and to brotherly kindness love. and to piety brotherly kindness, and to brotherly kindness love. And, in your godliness, brotherly affection, and, in your brotherly affection, love. and with piety fraternal affection; and with fraternal affection love. piety by brotherly affection, and brotherly affection by love. along with power of endurance, godliness; along with godliness, brotherly affection; and along with brotherly affection, love. piety with brotherly affection, brotherly affection with universal love. and in godliness, brotherly affection; and in brotherly affection, love. and to piety brotherly affection; and to brotherly affection charity. 6 and in your knowledge, self-control, and in your self-control, perseverance, and in your perseverance, godliness, 7 and in your godliness, brotherly kindness, and in your brotherly kindness, love. 8 For if these qualities are yours and are increasing, they render you neither useless nor unfruitful in the true knowledge of our Lord Jesus Christ.